6 Ways Yoga Can Change Your Life - Welcome to SarahKesseli.com! 6 Ways Yoga Can Change Your Life. Just like it did mine. I started practicing yoga consistently in 2012, after injuring my hip and spine working out too intensely during marathon training (insert: was not listening to my body). Since then I have been consistent with a 2-3x per week yoga practice until last fall. Life got crazy; I got lazy, and I stopped going. Fast forward to February of this year and everything in my world changed. I had pain from my neck to my hip that came on suddenly one day (I will be sharing more on this later). Once again, I had to remove all weight lifting and cardio completely from my life. Even walking was too painful. But, the one thing I could do was yoga. I am not talking Vinyasa Flow, Bikram or Hatha yoga. As much as I love those styles, they were too physical. Restorative and Yin Yoga were the extents of what I could handle. Now, I have been practicing both of these styles since 2012, but I never gained the full benefit and understanding of them until these last few months. Yoga helped me when I needed it the most. It helped heal me both physically and mentally. It helped me cultivate a sense of calm that transformed my life. It taught me to disconnect from technology and work (I am a self-proclaimed work-a-holic), to become more present in my life, to listen to my body and to accept myself as I was in the present moment. Here are 6 Ways Yoga Can Change Your Life. Jus like it did mine. Heal My Body: As I mentioned above, I began yoga initially after an injury and then got back into it after my injury this February. Both times, the stretching helped to release tightness in my muscles, allowing increase blood flow and detoxification to the injured areas. In Restorative and Yin yoga you hold poses for 3-5 minutes. These extended holds have the ability to restore and rebuild connective tissue. If done consistently, over time to result in healing. Disconnect: I am a very strong type A personality. I have a hard time putting work down and taking time for myself. Since any form of electronic device that would connect me to work is not allowed, I was ‘forced’ to disconnect. I am still a motivated overachiever, but I have found a much healthier balance. Become More Present: My mind is always running in 900 directions. My brain just doesn’t like to shut off. But at the start of almost every yoga practice, you will hear the instructor say, “Let everything that happened before now go for the next 90 minutes.” They are not asking you to forget the past, just to lay it aside during the class. Learning to let things go for the duration of class and focus on my body and mind in the present moment was a small step that spilled over into other areas of my life; at the movies, laying by the pool, talking with friends. It’s actually amazing how much more enjoyable things become when you put aside the distractions and focus on the present! Release Stress & Find A Sense Of Calm: If you know me, then you know that my type A personality runs at 500 miles per minute, which leaves no room for calm or stress relief. In yoga, they teach you how to breathe to calm the mind, slow the heart rate and relax. The relaxing feeling you gain during yoga will linger long after the practice is done too! After a while, I began noticing that I felt much more relaxed throughout my days. Stressful situations didn’t seem quite as intense anymore. And when something stressful did come up, I would close my eyes, begin to take long, slow deep breaths and calm my mind. Listen To My Body: As I’m sure you have guessed by now, I am notorious for not listening to my body. I would always push, push, push until my body said, “No more!” and would force me to stop. In yoga, you become very aware of how your body feels. You learn to quiet your mind and become more present with what is going on at that moment. Like the other benefits above, this also translated into my everyday life. Healing from the arm injury, some days I would want to keep going, despite the pain, to get things done. But, yoga has helped me learn to stop and listen to what the pain is telling me; rest, relax. Accept Myself: Yoga has helped me become at peace with ‘what is’ even if it is not how I would want it to be. I have accepted that due to years of beating up my body through improper nutrition and over exercising that I will not be able to lift as much as others or run as fast. But you know what, that’s ok! I am me. I am made perfectly and beautifully. Just the way I am supposed to be. Above all, yoga has made me happy. Happy with myself, happy with life, happy with what is. It makes me happy when it comes time to roll out my yoga mat, turn off the world and tune into myself. *I practice yoga both in a studio and at home. The benefits of yoga do not require you to spend any money! I share a lot of my favorite (free) yoga videos on my YouTube channel and on my Pinterest board! Give them a try! 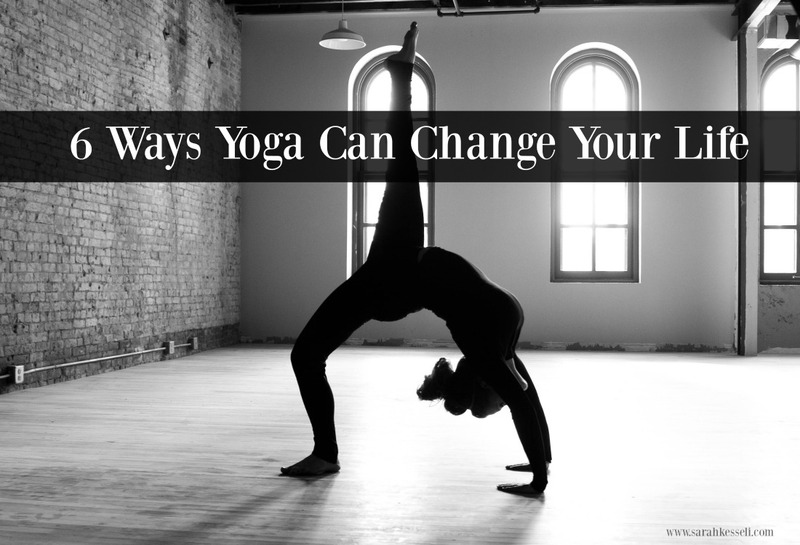 Maybe you will find 6 Ways Yoga Can Change Your Life too! I would love to hear your thoughts on yoga! Do you practice yoga? Have you ever felt any of these benefits? What other benefits have you felt? Also, make sure to check out my favorite yoga gear brand! I use their mat and towel for at home or studio yoga and their yoga bag to store and carry them! They are awesome quality and fun colors to match to the focus of your yoga practice!